Ian and I are headed to Oxford this weekend after attending the Kings College Garden Party (because we’re fancy!). I am super excited to visit my old stomping grounds – we’re going to hit up the Pitt Rivers Museum, Worcester College (alma mater!) and Ben’s Cookie Bar, because I’m obsessed with that place. And maybe the botanic gardens and the Ashmolean. We can really do a tourism blitzkrieg when we set our minds to it – which we proved in Bath. We got in on Friday, and went to see School for Scandal (as I mentioned in a previous post). On Saturday, after going to Jika Jika for breakfast, (a bar owned by rugby players) we hit up the Roman Baths (Bill Bryson has his own audio tour, which actually was a disappointment. It wasn’t funny, although it wasn’t trying to be. The actual informative audio tour was great. Two hours (plus 30 minutes spend queuing) well spent. After a leisurely morning, we went to The Circus for an amazing lunch, and then went to the Assembly Rooms, which also houses the Fashion Museum. I was particularly excited because the Assembly Rooms are featured in Persuasion, which is possibly my favoritest favorite movie ever (there’s a photo in the montage above). It was so evocative of Jane Austen for me – even more than the Jane Austen Centre. 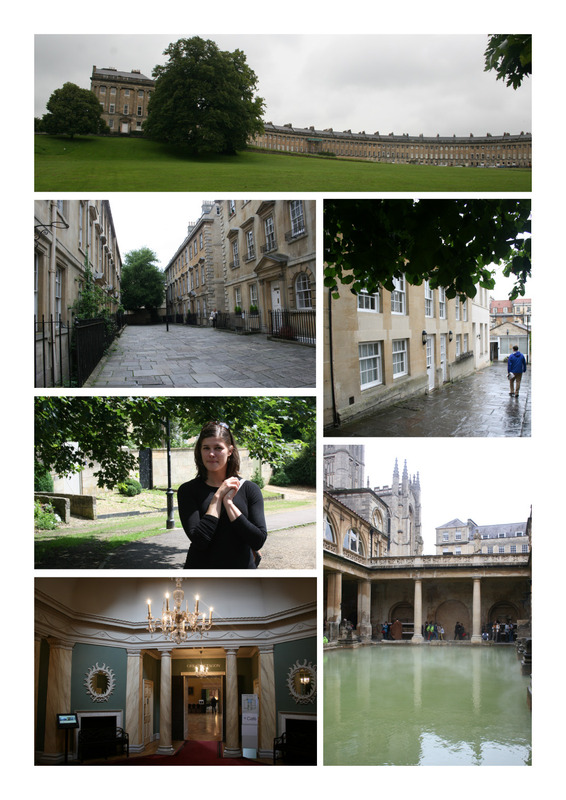 Sunday we hit of the Jane Austen Museum and then did a small tour of Bath crescents. The Royal Crescent is the famous semi-circle (crescent) of Georgian buildings; they were actually built by the George who gave his name to Georgian buildings because he was the first monarch to get really into spas and taking the waters. The crescent shape caught on, and there are a few of them scattered around the city. We were also able to work in more of the sets from Persuasion – there is a gravel path where Anne and Wentworth walk together (one of the only places they would have had any privacy, apparently – the picture of me was taken there, during the five minutes that it wasn’t raining); one of the less fashionable crescents where Anne’s family took rooms (it looks pretty down-at-heel today, to be honest). And it turns out that our hotel was immediately adjacent to the place where Jane stayed on her first stay in Bath. She wasn’t ever very happy in Bath – she grew up in the country – but as the setting of many scenes from her books, it still comes alive. There’s Georgian stuff everywhere. There’s plenty in Cambridge, but its a whole other thing in Bath. The best part about the ramp-up to Bath is that Ian and I considered many potential destinations before settling on one, so we’ve got a backlog of fantasy holidays locked and loaded. Bring on the adventure!